We’re still two months away from Christmas yet it’s never too early to anticipate the good times ahead when we’ll observe the sacred traditions that stimulate positive memories from the past. For me, one such ritual is revisiting the Christmas classic “It’s a Wonderful Life,” the tale of everyman George Bailey (played by Jimmy Stewart) and his look back at his own life alongside guardian angel Clarence who was sent to Bedford Falls to help the small town good-guy realize that he’d really led a very consequential and worthwhile existence. There’s a part of the legendary movie that reminds me a little of what’s going on with elements of the Republican donor establishment these days. In one famous scene, Mr. Potter, the film’s greedy old scrooge-like miser invites Bailey into his office to try and sweet-talk the man into abandoning his business, thus obtaining through addition what Potter couldn’t earn through beating his rival at his own game. Unsurprisingly, Bailey informs Potter he won’t be bought. How does George Bailey and Mr. Potter relate to today’s noxious DC swamp? Some GOP establishment groups are bringing in Steve Bannon to headline their events, in essence to “hire” him. Are they also trying to co-opt him at the same time? David M. Drucker of the Washington Examiner reported, “The Republican establishment that Steve Bannon is agitating to overthrow is welcoming the nationalist firebrand through the front door to pitch his rebellion to the party faithful. “The California Republican Party's fall convention this past Friday; Washington's conservative Hudson Institute think tank on Monday; and a scheduled Macomb County, Mich., GOP ‘unity’ dinner on Nov. 8. Drucker further reported these establishment groups are courting Bannon to appear at their events to help raise money and sell tickets, not necessarily just to endorse Bannon’s political crusade to rid the GOP of its current feckless leadership. Fair enough; the former Trump campaign CEO and current Breitbart chairman needs access and recognition more than empty assurances and promises from party blue bloods. The fact Bannon is receiving these invites at all is somewhat astonishing considering it’s taken years for the donor establishment to even acknowledge the grassroots’ contributions to the majorities the party now enjoys in Congress. Starting with the Tea Party rebellion in 2010, populist/conservative consortiums sprung up around the country to protest the unconstitutional growth of government, which was fostered almost equally by Republican leaders as well as Obama and the congressional Democrats. At least the Democrats don’t pretend to be for limited government; they’re all about bringing home the bacon and then serving it up on bronzed platters with “vote Democrat” etched into the bottom. They’ve already got half the American population hooked on some form of government transfer payments and with each passing year the problem only gets worse. That’s what Bannon and other conservatives are referring to when asking people to sign-on to their efforts to drain the swamp. And judging by some in the donor establishment’s reaction to Bannon’s spiel, they figure it’s a message that attracts attention. Other swamp creatures aren’t as willing to acknowledge the writing on the wall. Senate Majority Leader Mitch McConnell thinks Bannon is leading the party to ruin. Bradford Richardson of the Washington Times reported, “Senate Majority Leader Mitch McConnell hit back at Steve Bannon and his anti-establishment faction on Sunday, saying the movement to run maverick congressional candidates in Republican primaries next cycle is being spearheaded by ‘specialists in nominating people who lose’ elections. A GOP majority sooner? Would that have made any practical difference today? If the entertainment industry ever does a remake of “It’s a Wonderful Life” then Mitch McConnell would be first in line to play the grumpy Mr. Potter. McConnell and other ruling class elites can’t defend their awful legislative record so they’re dragging out the tired refrain that people like Bannon – and Trump – are basically just political Don Quixotes chasing windmills with candidates that aren’t electable. Those lost senate seats McConnell referred to (in 2010 and 2012) involved conservative anti-establishment primary candidates who managed to bump off the elites’ chosen nominees (and in one case, an incumbent) and then subsequently lost in the general election to their Democrat opponents because the party pulled monetary support, etc. Their names, in case you forgot them, are Todd Akin (Missouri), Christine O’Donnell (Delaware), Richard Mourdock (Indiana), Ken Buck (Colorado) and Sharron Angle (Nevada). Buck is currently serving in the House so at least the good people of northern Colorado had the good sense to ignore the establishment and elect him anyway. A similar kind of establishment snub occurred here in Virginia four years ago when conservative Ken Cuccinelli won the Republican Party’s gubernatorial nomination but was stymied in November because the state party elites (led by sour grapes loser Bill Bolling) wouldn’t get behind their own candidate. Because the ruling class didn’t get what they wanted they took their ball and went home; Virginians have suffered under Terry McAuliffe and ultra-liberal Attorney General Mark Herring (who single-handedly decided not to enforce the state’s popularly sanctioned traditional marriage amendment) ever since. Make no mistake – if Cuccinelli had enjoyed the enthusiastic support of the state party back then he would have won in 2013 (the final margin was a little over two points in a three-candidate race). In addition, McConnell conveniently omits the whole story on the establishment candidates that did win in primaries and in their general elections, including men like Mississippi’s Thad Cochran who used dirty campaign tactics to defeat conservative challenger Chris McDaniel (in June, 2014) and John McCain who pulled out all the stops last year to stifle threats to his 30-plus year stay in Washington. The problem is now Cochran is so frail and ill that he doesn’t function well and of course McCain is afflicted with (most likely) terminal brain cancer. If those two alone had ceded their seats to real conservatives the senate would have had reinforcements to the younger generation of boat-rockers such as Ted Cruz, Mike Lee and Rand Paul. A good argument could be made that just about any race is winnable if the GOP puts its full effort into it. As Trump’s victory proved last year, if party forces combine with conservative/populist grassroots groups then even blue territory is open for competition. All Republicans need to do is turn over the recruitment reins to people like Bannon who have a great sense for the public’s pulse when choosing candidates to back. It’s really not hard to understand. Bannon’s greater mission is to drain the swamp in Washington and it will continue even if Trump should choose to remain on the sidelines. 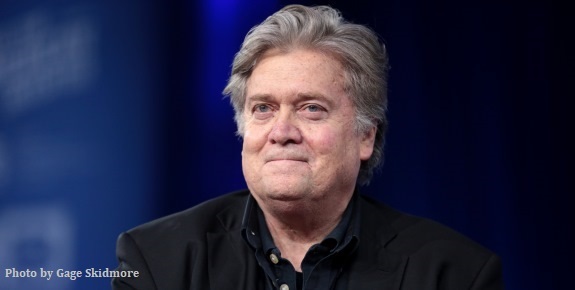 Gabby Morrongiello of the Washington Examiner wrote, “For the last several weeks, Bannon has been jetting between both coasts for meetings with GOP megadonors who have spent years contributing to super PACs aligned with McConnell and other establishment forces, Politico reported last week. So far, the former West Wing staffer has sat down with casino magnate Sheldon Adelson, Home Depot executive Bernie Marcus, and venture capitalist John Childs, among others. “A source involved in Bannon's outside group Great America said he has ‘millions lined up right now’ and plans to launch an aggressive ad game once 2018 draws nearer. Morrongiello’s article suggests some Republicans wonder why Bannon continues his efforts against senators who have proven to be reliable votes for Trump’s agenda. The real question is where were these people last fall when Trump’s campaign was struggling against the news media’s narrative that he was a candidate so toxic that even his own party couldn’t stand him? Casting a silent vote in favor of an agenda item doesn’t really mean anything. Technically speaking the establishment leadership has been “for” everything Trump has proposed; and while it’s true McConnell did go to bat to get Trump’s cabinet nominees – and Justice Neil Gorsuch – confirmed the majority leader has been reluctant to criticize the McCains, Murkowskis and Flakes of the senate who have been openly hostile to elements of Trump’s “Make America Great Again” movement and to the president himself. Enacting President Trump’s agenda into law is going to take leadership and actions by people who are willing to put themselves on the line politically to accomplish great things. To win, he’ll need more good senators in position. Men like Steve Bannon will make sure Trump gets them.